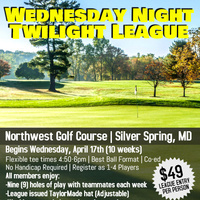 Join us Wednesdays at Northwest Golf Course! Open to the public, Best Ball format league with a 10-week season. All skill levels welcome (No handicap required). Flexible tee times from 4:50-6:00pm Wednesdays beginning April 17th. League entry is $49 per person and $30 daily fee includes cart ($20 walking).